You know what would make an awesome Father’s Day gift? A Nest thermostat. 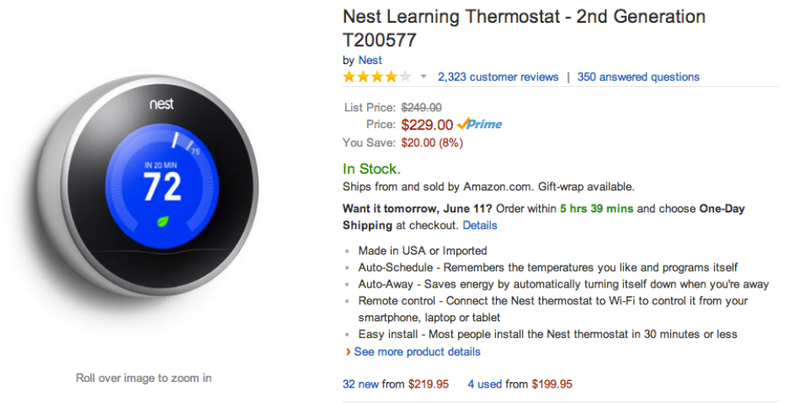 For a limited time only, you can grab a Nest smart thermostat from Amazon for $20 off of the retail price, bringing your total to $229. Not a bad deal for your tech savvy dad. For those not familiar, Nest is a thermostat that you can install by yourself, in your home, in place of your current thermostat. The company claims to save you money throughout the calendar year by performing more efficiently than your current thermostat, since it learns your patterns and adjusts temperatures based upon them, automatically. Nest has apps on both Android and iOS along with a web interface, so more times than not, you can control Nest from anywhere. It sports a modern industrial design, is easy to setup in your house, and can be paired with multiple Nest thermostats throughout your home. It’s a pretty sweet accessory for any homeowner (or renter). Follow the link below to grab the deal.